A.Kessaev was born in Digora, North Ossetia. During the Civil War he fought within Red Army Special Forces against White Guardians (Old monarchy regime defenders and anti-communists). A.Kessaev went through the long way, ending up with the major-general rank. In 1941-1945 (The WW2 on Soviet territory) he was in command of the military railway formations. 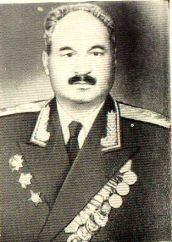 For the outstanding contribution to the advancement of the Red Army troops and military cargos, in 1943 Kesaev was honored with seven orders and many medals.